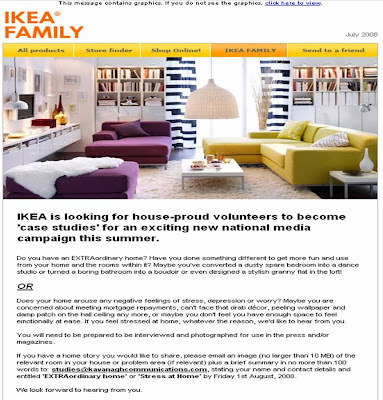 'IKEA is looking for house-proud volunteers to become 'case-studies' for an exciting new national media campaign this summer.' This was the headline, and main news, on a recent email I have received from the IKEA Family club. There are two target audiences for this activity - firstly it is aimed at those who have 'EXTRAordinary homes' and secondly those who have 'Stress at home.' The IKEA email states that those who submit 'photos / information will be interviewed and photographed for use in the press / magazines.' Kavanagh Communications are running the promotion on IKEA's behalf and to apply you need to send a photo and a summary of up to 100 words. Entry address is listed on the image included in this post - but you'll have to move fast as closing date is 1st August! The interesting thing with this IKEA promotion is that there is no incentive to consumers, other than them being given the chance to appear in national press or a magazine. There are no offers of home makeovers or free products, just the chance to be included in a sponsored feature promoting IKEA.